We are no offering prewired kits for the Jaguar! Jazzmaster Players - Check out our article on Reverb.com titled "Jazzmaster Wiring Mods" where we demonstrate how to implement our STB Jazzmaster mod which includes series/parallel switching, dual volume controls, and a PTB tone stack in the rhythm circuit. 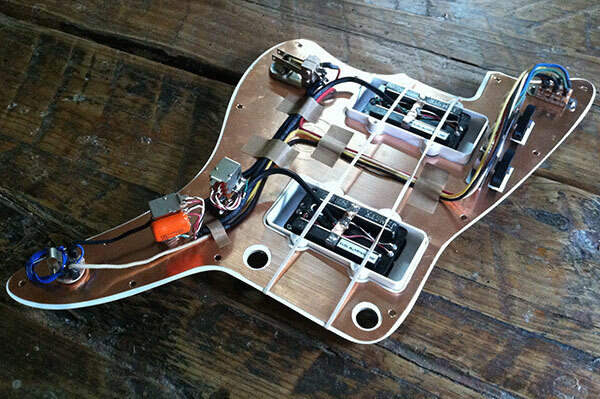 We are now offering Tone-Guard anodized pickguards with our prewired assemblies. Jazzmaster Players - Check out our article on Reverb.com titled "Upgrading Jazzmaster Electronics"
We are now offering a an option for Joe Barden JM Two/Tone™ pickups. Theses are full-sized dual blade humbucker pickups where each pickup has 2 modes: Full Humbucking mode, and Single Coil sounding mode, but both modes are dead quiet!! No 60 cycle hum is anywhere to be found. Online ordering is here.